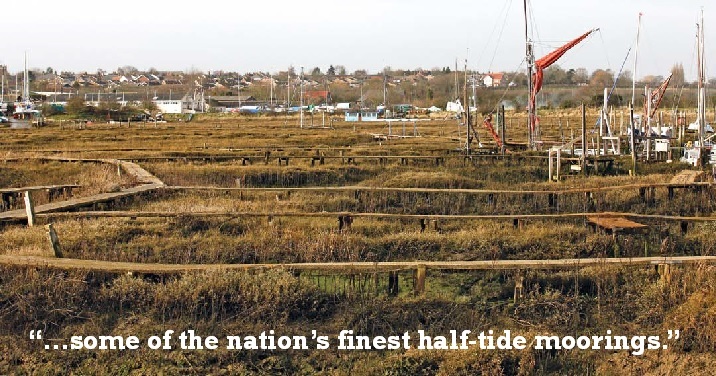 Our saltmarsh site has 120 mud berths; these are natural berths, each of which has a timber staging which provides good shore access. A well maintained network of footpaths and board walks provides easy access to the berths. Water access to the creek is dependent on the tide and the depth of the vessel – we enjoy between one/two hours either side of high tide. See also details on inclusive customer facilties. We have a Mooring Guide available to download, for guidance on tying up your vessel. For more info, go to our Charges, Ts&Cs page. Read more about our moorings in this Yachting Monthly article on Mud Berthing Know How.